In CWCF’s recently approved strategic plan, one of the priorities established was increased member engagement. Members want to build greater connections with each other and learn from each other’s successes and challenges. That’s why we’re going to start profiling one of our member co-ops in each issue, beginning with Fourth Pig Construction. We hope these brief profiles will be engaging and informative and lift up the human side of co-ops. When Fourth Pig Construction launched in 2007, its founders were out to make a difference, both in the type of buildings they made and the type of business they established. They were going to make and renovate buildings using green building methods that would reduce carbon emissions. And they were going to be a worker co-op. “Our feeling was that if we want to build differently then we should also have an organization that’s more sustainable, to sort of model in our practices what we try to do in our work”, says co-founder Matt Adams. 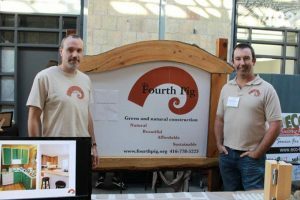 Although Fourth Pig, which is based in Ontario’s Muskoka region, takes pride in the design of their buildings, there’s a lot more to their mission than mere construction. In keeping with their objective of reducing greenhouse gases from the construction sector, they’re also committed to educating the public about the importance of changing how buildings are made. To this end, they organize and present talks, distribute a newsletter about green buildings and energy, and constantly seek out and research best practices when it comes to green building. Even if they’re not a typical construction company in some ways, however, Fourth Pig hasn’t been immune to the challenges facing other companies in the sector. There was the initial obstacle of an economy in the early throes of a recession upon their founding, and the perpetual struggle of earning customers’ trust in an industry where “fly by night” companies can sometimes tarnish everyone’s reputation. But Adams thinks that on the whole, Fourth Pig has handled these issues well. “We’re trying to be different, and fair and honest, so earning the trust of people is a bit of a challenge”, he says. “I think we’ve done a pretty good job of it”. Being a co-op, despite the more democratic structure and other advantages it offers, has also presented its own challenges, such as lenders and regulators who sometimes possess little knowledge of the co-op model. Adams finds the best solution to this is for co-op workers to have a good understanding of the model themselves, which they can achieve by actions such as taking good notes at every step of the process. Working with other co-ops has also been a key part of Fourth Pig’s mission. The Muskoka North Good Food Co-op (MNGFC) officially opened their store recently and Adams says Fourth Pig was proud to have been involved with making that happen. “Starting any new business is challenging and I think it helped that we had two co-ops working together that share co-op principles – it helped to guide decisions and actions as everyone worked toward getting the store open”. With an upcoming staff retreat, Fourth Pig will be doing some visioning for the next few years soon. Few of the details have been ironed out yet, but Adams says the company hopes to continue to grow and develop sustainably — just like the buildings it creates.